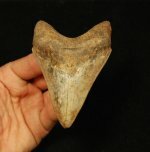 New Products : Fossils Online, Welcome! 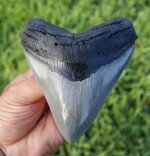 Amazing preservation on this land found tooth from Sarasota County, FL. Very sharp serrations, super smooth enamel, great shape and outstanding ...more info. Found many years ago in the Gulf of Mexico off of Venice. This bobcat jaw is one of the nicest that I have seen come from here. Highly desirable cat ...more info. 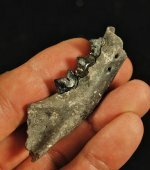 One of the finest land found teeth from Venice that I have been able to acquire. Absolutely amazing preservation. Extremely sharp serrations, nearly ...more info. Sharply serrated lower with a great bourlette and the added, interesting bonus of the barnacles. 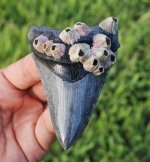 I happen to like some teeth that have sea life ...more info. 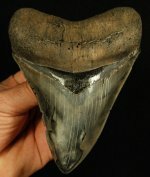 I love the shape on this tooth. 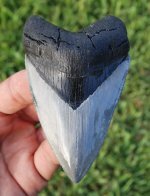 Very symmetrical tooth that has sharp serrations and a bourlette that really stands out. 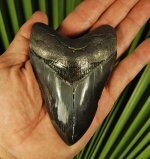 Leaps and bounds better than the average megalodon tooth found in the Gulf of Mexico off of Venice. 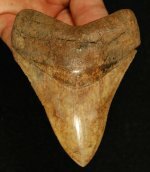 Attractive, wide shaped tooth that has sharp ...more info. Quality tooth with nice color. Fairly large, very Sharp serrations. Nice colors. 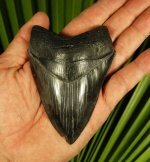 Attractive, symmetrical tooth with coarse serrations. 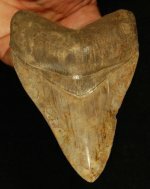 Symmetrical tooth with sharp serrations. Great price on this quality tooth. 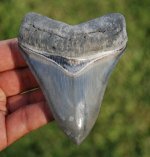 Upper principle tooth that has a great shape and sharp serrations. 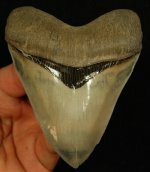 The enamel on this tooth is like liquid tar. Very glossy and smooth. 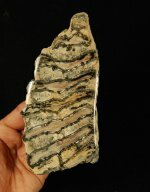 The bourlette and root has a light coating of pyrite covering them. If you were ...more info. Attractive slice from the Gulf of Mexico off of Venice, FL. Measures 3 1/2" x 2 1/2". Attractive slice from the Gulf of Mexico off of Venice, FL. Measures 3 1/4" x 2 1/4". Attractive slice from the Gulf of Mexico off of Venice, FL. Measures 6" x 2 3/4". Attractive slice from the Gulf of Mexico off of Venice, FL. Measures 3 1/4" x 4 1/4". Attractive slice from the Gulf of Mexico off of Venice, FL. Measures 3" x 3". Complete, very heavily mineralized upper arm bone of a whale from Bakersfield, CA. Part of the Bob Ernst estate. Excellent, highly detailed tooth on original matrix with some manganese. From the Bob Ernst estate. The tooth measures 11/16" wide. Large spine. Not a common find. 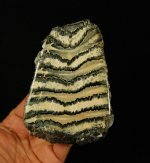 Interesting slice from the Gulf of Mexico off of Venice, FL. The non polished side is actually the chewing surface, although it doesn't have the ...more info. Glass like finish with great color from the Gulf of Mexico off of Venice, FL. Measures 2 3/4" x 2". 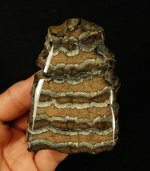 Beautifully polished slice from the Gulf of Mexico off of Venice, FL. Measures 2 3/4" square. Perfect ear still in original matrix. Very nice, fairly large tooth with lots of swirly color throughout the enamel from barnacles that were attached to the tooth. 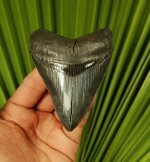 Great tooth with sharp serrations and complete bourlette. Lots of teeth come out of this river and it's nice to be able to get one with a complete ...more info. 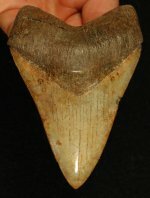 Sharply serrated tooth with complete bourlette. The color on the non display side is striking. Some of the barnacle marks are still visible on the ...more info. 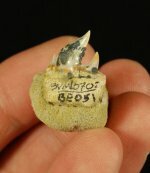 Gorgeous tooth with sharp serrations, detailed root and very nice, dense bourlette. The enamel has black swirled throughout. Fairly large, very ...more info. What a heart breaker! If it weren't for the feeding wear on the one side, this tooth would be perfect. It was everything going for it. Shape, ...more info.